If you’re in the market for heating, cooling, humidifying or air cleaning equipment, you’re facing a number of decisions. There are dozens of models to choose from, in a wide variety of designs, efficiencies and prices. In fact, the technology of HVAC equipment has advance more rapidly in the last decade than in the previous five. How can you wade through the choices and find what’s right for you? First, ask yourself what you’re looking for? Since 1947, we’ve been providing this area with quality products from Lennox and other fine manufacturers. And offering quality product lines is just the beginning. Because no matter how well made a product is, the comfort, reliability and energy efficiency it provides depends on the company that stands behind that product. In fact, service is probably the most important aspect of your equipment purchase. Studies have shown that the efficiency of a heating or cooling system can vary as much as 30% depending on the quality of the installation. So if you’re planning to invest in a high quality, high-efficiency system, we suggest you invest some time in learning about the dealer, too. 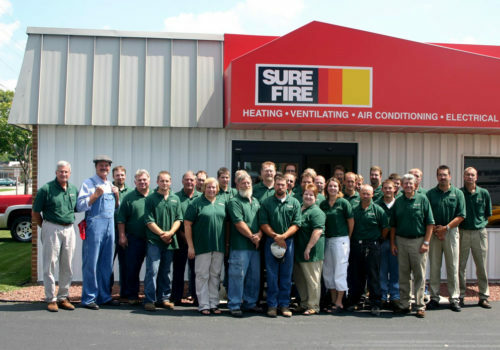 At Sure-Fire, we work hard to provide you with the very best in customer satisfaction and service. You’ll notice the difference after just one call to Sure-Fire. We won’t provide you with over-the-phone recommendations or stab-in-the-dark estimates. Instead, one of our qualified representatives will come to your home at your convenience to analyze your home’s unique heating, cooling and ventilation requirements. Based on that data, we’ll suggest exact models and sizes of equipment, and provide you with a written cost estimate. There’s no cost and no obligation – just good, hard facts on which to base your buying decision. Once you’ve chosen Sure-Fire, our top-notch service continues. Our factory-trained technicians will install your equipment promptly and courteously. They’ll discuss installation options with you and ensure that your new purchase is custom-fit to your home. We maintain a full-scale sheet metal shop that allows us to custom-build ductwork for a more exact fit. Remember, quality installation can mean the difference between your system running efficiently and economically – or wasting energy and money. You won’t find technicians with more skill and training than our team at Sure-Fire. In addition to attending programs by manufacturers and industry representatives, our technicians receive ongoing training at our own in-house school twice a month. It’s just one more way to keep abreast of today’s innovative technology…and on more way of offering superior service to our customers. When it comes to maintaining and serving equipment, Sure-Fire employs one of the largest fleets in the region. Should you even require servicing, Sure-Fire offers computer and radio dispatched, 24-hour service. We maintain a fully stocked in-house Parts department and fully stocked service trucks, practically eliminating any delay in repairs. Ensuring prompt service is so important to Sure-Fire, in fact, that our staff has three times as many service technicians as installers. We spend more time servicing other dealers’ equipment than our own, year after year. We think you’ll agree that alone says a lot about our service staff. If you plan to talk with other contractors in your area before making a buying decision, consider how they stack up against Sure-Fire. The following checklist will help you make a few comparisons. We encourage you to use it – because once you’ve talked with the competition, we’re pretty confident you’ll come back to Sure-Fire. How Does the Competition Stack Up Against Sure-Fire? Can the other contractors you’re considering answer “yes” to all these questions? Does the company carry leading brands of quality, high-efficiency equipment? Has the company been in business long enough to know its business? work to fit your needs? Is the company licensed and insured. Are its trucks identifiable with the company name? Does the company use radio and computer-dispatched trucks to speed service? Are its trucks well stocked with parts and supplies? Are service technicians available 24 hours a day, 7 days a week? Does the company have a separate service department dedicated to prompt emergency service? Does the company provide continuous training for its technicians and service installation mechanics? Does the company maintain a service history on customer equipment? Is the company computerized to ensure prompt and efficient customer service? Does the company provide a written bid and guarantee? Are the company’s workers covered by liability insurance while working on your premises? Can the company provide you with a list of references? At Sure-Fire, we carry only quality products from well-known, dependable manufacturers. We wouldn’t put our name behind anything less. But with even the finest heating and air conditioning equipment, things can sometimes go wrong. That’s why we train our service department to be the best in the area, and why we offer a variety of maintenance plans to protect your investment. Our service fleet is available 24 hours a day, via fully stocked, radio and computer dispatched trucks. Your furnace went out at midnight? You air conditioner quit on a hot Sunday morning? No matter what your problem is or when it occurs, one of our factory-trained service technicians will be at your home or business quickly to solve it. It doesn’t take an emergency to benefit from Sure-Fire’s service. Our Club Membership plans keep your equipment safe, efficient and running smoothly. With Sure-Fire Plan Service, your equipment will receive year-round, regularly scheduled service from one of our trained technicians. They’ll add years to the life of your equipment by cleaning and calibrating controls, greasing and oiling moving parts, and cleaning filters and coils for more efficient operation. What’s more, regularly scheduled maintenance enables us to find potential problems before they cause a major service interruption and result in costly repairs. Independent studies show that homeowners without maintenance plans for their HVAC equipment pay an average of $300 more per year on service calls and energy costs. Doesn’t it make sense to pay just a fraction of that to keep your equipment well maintained and worry free? Call Sure-Fire today to find the Planned Service Agreement that’s right for you. For most Wisconsin homeowners, home heating is your most costly energy expense. That’s why it makes sense to explore high-efficiency furnaces. With today’s technology, high-efficiency equipment means more of your energy dollars are used to heat your home – not wasted on heat lost up your chimney. The energy efficiency of a furnace is determined by its Annual Fuel Utilization Efficiency (AFUE) rating. The higher the AFUE, the more heat you receive from the same amount of fuel. If your gas furnace is more than 10 years old, its AFUE rating probably falls in the 55- to 60% range. Compare that with a new high-efficiency model: the Lennox SLP98V for example, boasts efficiency ratings as high as 98%. Over the course of a long, cold Wisconsin winter, that increased efficiency can translate to hundreds of dollars saved in energy bills. Let’s say your annual heating costs currently run about $1200. Replacing your furnace with one that’s 40 to 50% more efficient would save you approximately $500 in a single winter. After just a few years, the furnace will have paid for itself. And the subsequent savings? That’s money in your pocket! At Sure-Fire, we offer quality Lennox and Aire-Flo furnaces in a variety of sizes and efficiency ratings to meet your specific needs. Along with their excellent energy efficiency features, Lennox and Aire-Flo products are extremely reliable and easy to service. Many of their products are protected by a lifetime heat exchanger warranty as long as you own the furnace. For a no cost, no-obligation estimate, give us a call. We’d be happy to visit your home, conduct a heating load calculation and recommend the equipment that would best meet your home’s heating requirements. Let Sure-Fire show you how to stay warm and save money this winter. Through Wisconsin is known for its cold, snowy winters, the hot and sticky weather of summer can get awfully uncomfortable, too. When temperatures soar, the only way to really keep cool is with a central air conditioning system in your home. At Sure-Fire, we offer only quality, dependable Lennox air conditioners in a variety of models to suit your home and budget. Why Lennox? They’re manufactured of the finest materials – cooling coils are made with superior copper tubing, for example, rather than cheap aluminum. They have a proven track record – Lennox has been in the HVAC business for over 100 years. They’re quiet, reliable and among the most energy efficient on the market today. Air conditioner efficiency is measured by what’s called a Seasonal Energy Efficiency Ratio, or SEER. This ratio is calculated by dividing a unit’s cooling capacity by the amount of electricity (in watts) needed to operate it. The higher the SEER, the better the energy efficiency of the unit – and the bigger your savings. Lennox units have SEERs ranging from 13 to 21. By replacing an older, less efficient air conditioner with a Lennox, you can cut summer cooling bills almost in half! Let Sure-Fire show you how to cool and dehumidify your home this summer. For no cost and no obligation, one of our trained representatives will visit your home at your convenience. They’ll recommend a Lennox air conditioning unit to meet your home’s cooling load requirements, and provide you with a cost estimate that shows just what you can expect to pay – and how quickly you’ll recoup that money in energy savings over less efficient models. Sure-Fire and Lennox – keeping you cool and dry on even the most sweltering summer days. Humidifiers and dehumidifiers help control the moisture level in your home to increase your comfort. In our cold winter climate, very dry indoor air is often a problem during the heating season: heated air dries and shrinks wood framing around doors and windows, allowing warm moist air to leak out and cold, dry air to seep into your home. along with the heat loss – and the higher heating bills associated with it – you may notice a build-up of static electricity, unhealthy houseplants, chapped lips, a dry nose or throat, even wall and ceiling cracks and loosening furniture joints and flooring. At Sure-Fire, we carry quality Lennox and Aprilaire humidifiers that safely and efficiently put moisture back into your home. Just as you would set a thermostat at a specific temperature, simply set the humidistat at the desired level; when the humidity falls below that setting, the unit is activated, distributing natural water vapor throughout your home. Dry, parched air disappears, reducing its damaging effects and leaving you warm and comfortable. Some homes, however, face the opposite problem of excess humidity. In most cases, kitchen and bathrooms are the culprits: Activities like hot showers and boiling water for cooking create excess moisture that’s often trapped in the home. If left unchecked, a build-up of moisture can lead to telltale signs like mold, mildew and peeling paint – or more severe problems like damaged insulation and rotting wood. These humidity problems can be corrected by properly ventilating the home, using ventilating fans and, in some cases, installing an air-to-air heat exchanger. Fortunately, most humidity build-up can be prevented easily and inexpensively with ventilating fans. By simply installing these electric fans in your kitchen and bathrooms, excess moisture is exhausted outdoors with the flip of a switch. Within minutes, humidity levels return to a more natural level, eliminating potential problems. Ventilating fans must be sized properly to provide the necessary number of air exchanges that control humidity levels. The capacity that’s right for your depends on the size of the room to be vented and its humidity level. At Sure-Fire, we offer ventilating fans in a variety of capacities and styles to meet your needs. We provide prompt installation services, too. Make sure the humidity level in your home is safe and comfortable. Give a call to Sure-Fire. Chances are, the air in your home is loaded with unseen pollutants – from hair, dust and tobacco smoke to nearly invisible viruses, pollen, mold and spores. Most of these particles are so tiny that only a fraction of them are captured by traditional air filters. Instead, they’re continually recirculated through your home, aggravating allergies, shortening the life of upholstery and draperies, and leave a greasy film on windows, mirrors and furniture. You scrub, you launder – and the pollutants and stains come right back. First, have built-up pollutants removed from your heating system’s ductwork. Your home’s dark, moist air ducts are a haven for unhealthy indoor air pollutants. Unless they’re mechanically removed, they continue to grow and prosper – and you continue to breathe them in day after day. With Sure-Fire’s new high-powered vacuum truck, we’ll draw those allergy-causing dirt and germs out of your ductwork and out of your home, and then add a disinfectant and deodorant to keep them out. Second, consider an energy-efficient air cleaner. Installed to your home’s heating and cooling system, an air cleaner intercepts pollutant particles on an easy –to-clean filter, leaving the air that’s recirculated throughout your home up to 15% cleaner and healthier. That means less sneezing, coughing and cleaning. What’s more, an air cleaner from Sure-Fire costs just pennies to operate, since it uses the existing blower/fan on your home’s heating and cooling system. In fact, it protects the operating efficiency of your system by keeping furnace and air conditioner coils free from dirt buildup. Owning and operating an air cleaner can actually save you money! Provide your family with a clean, healthy and allergen-free home environment – with a little help from Sure-Fire. Though no longer the predominant heat source that they were years ago, hot water boilers do a better job than ever of creating a warm, draft-free home. With a hot water boiler system, natural gas heats water to temperatures ranging from about 120 to 180 degrees Fahrenheit. A circulator then pumps this hot water through a supply main to radiators throughout your home where the heat is dispersed via natural air circulation. If you have an older home with a boiler system, chances are that it’s only 50 to 60% efficient – nearly half the heat you pay for isn’t being transferred to the circulating water and warming you home. That’s why you should consider installing a new high-efficiency boiler from Sure-Fire. New high-efficiency boilers boast efficiency ratings in the 80 to 90% range, thanks to a few important design changes. High-technology heat exchangers more effectively transfer heat from the combustion chamber to the circulating water. Better insulation holds heat within the system. Electronic ignition saves fuel by eliminating the need of constant pilot light. Circulating pumps move hot water through your home faster, reducing heat loss. In short, you’ll feel the warming effects of your new hot water boiler throughout your home – not waste heat up your chimney and through poorly insulated pipes and tanks. Why not get the most for you energy dollar with a high-efficiency boiler from Sure-Fire? We’d be happy to examine your current system and recommend a new unit that will both cut energy costs and create a warm, comfortable home this winter.